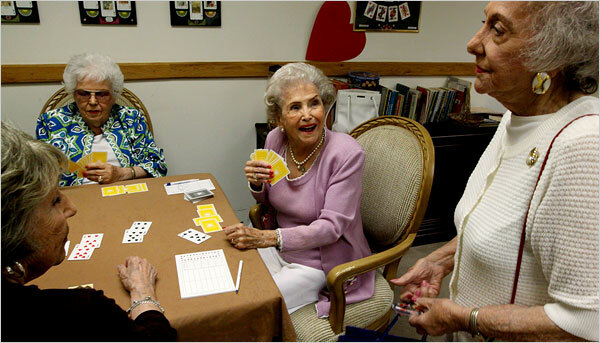 ​Georgia Scott, 99, center, during a game of bridge at her retirement community. “It’s what keeps us going,” she says. ​ Laguna Woods, Calif. — The ladies in the card room are playing bridge, and at their age the game is no hobby. It is a way of life, a daily comfort and challenge, the last communal campfire before all goes dark. For all that scientists have studied it, the brain remains the most complex and mysterious human organ — and, now, the focus of billions of dollars’ worth of research to penetrate its secrets. This is the second article in a series that will look in depth at some of the insights these projects are producing. ​​This bridge game is not for the timid. Norma Koskoff, left, Ruth Cummins and Georgia Scott expect the best from every player. If someone’s skills start slipping, it is time to find a new table. ​In recent years scientists have become intensely interested in what could be called a super memory club — the fewer than one in 200 of us who, like Ms. Scott and Ms. Cummins, have lived past 90 without a trace of dementia. It is a group that, for the first time, is large enough to provide a glimpse into the lucid brain at the furthest reach of human life, and to help researchers tease apart what, exactly, is essential in preserving mental sharpness to the end. ​Laguna Woods Village, a sprawling retirement community of 20,000 south of Los Angeles, is at the center of the world’s largest decades-long study of health and mental acuity in the elderly. Begun by University of Southern California researchers in 1981 and called the 90+ Study, it has included more than 14,000 people aged 65 and older, and more than 1,000 aged 90 or older. ​The researchers have also demonstrated that the percentage of people with dementia after 90 does not plateau or taper off, as some experts had suspected. It continues to increase, so that for the one in 600 people who make it to 95, nearly 40 percent of the men and 60 percent of the women qualify for a diagnosis of dementia. ​At the same time, findings from this and other continuing studies of the very old have provided hints that some genes may help people remain lucid even with brains that show all the biological ravages of Alzheimer’s disease. In the 90+ Study here, now a joint project run by U.S.C. and the University of California, Irvine, researchers regularly run genetic tests, test residents’ memory, track their activities, take blood samples, and in some cases do postmortem analyses of their brains. Researchers at Irvine maintain a brain bank of more than 100 specimens. To move into the gated Laguna Woods Village, a tidy array of bungalows and condominiums that blends easily into southern Orange County, people must meet several requirements, one of which is that they do not need full-time care. Their minds are sharp when they arrive, whether they are 65 or 95. ​They begin a new life here. Make new friends. Perhaps connect with new romantic partners. Try new activities, at one of the community’s fitness centers; or new hobbies, in the more than 400 residents’ clubs. They are as busy as arriving freshmen at a new campus, with one large difference: they are less interested in the future, or in the past. ​“We live for the day,” said Dr. Leon Manheimer, a longtime resident who is in his 90s. Yet it is precisely that ability to form new memories of the day, the present, that usually goes first in dementia cases, studies in Laguna Woods and elsewhere have found. So far, scientists here have found little evidence that diet or exercise affects the risk of dementia in people over 90. But some researchers argue that mental engagement — doing crossword puzzles, reading books — may delay the arrival of symptoms. And social connections, including interaction with friends, may be very important, some suspect. In isolation, a healthy human mind can go blank and quickly become disoriented,psychologists have found. Dr. Nir Barzilai of the Albert Einstein College of Medicine has found that lucid Ashkenazi Jewish centenarians are three times more likely to carry a gene called CETP, which appears to increase the size and amount of so-called good cholesterol particles, than peers who succumbed to dementia.